When talking about pork brands in Australia, no one can probably miss Murray Valley Pork. The company has a network of farms in southern NSW and northern VIC and this network is the supply source of the animals. The pigs are raised 100% Sow Gestation Stall Free and are protected under their animal welfare policy. The company claimed the finest quality pigs are hand selected and undergoes strict selection process to be included in the product range to ensure the tenderness and moisture level of the meat. 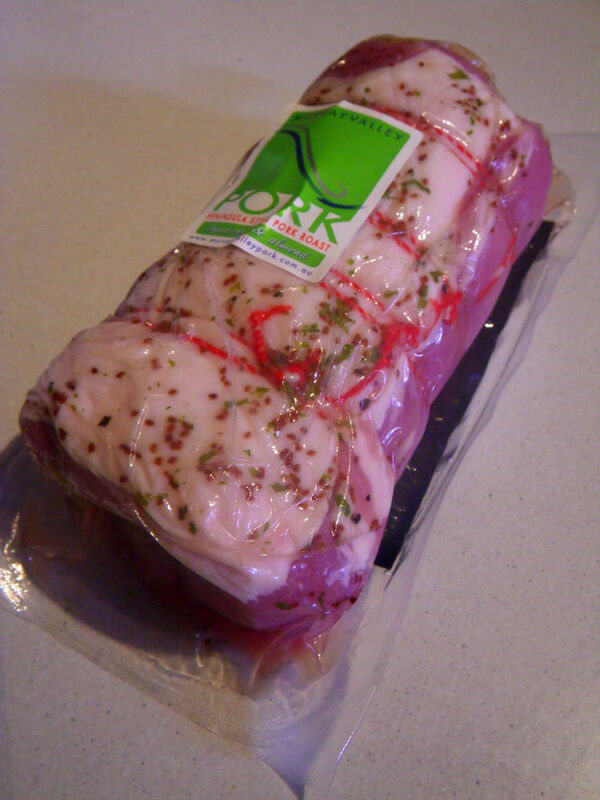 A main feature that Murray Valley Pork products is that they are versatile in the way of cooking. Included in the range are easy to cook meat for home cooks as well as meat that can be prepared more professional ways. The pork products were featured by Everyday Gourmet with Justine Schofield and has recently partnered with Manu Feildel. Fortunately, I was invited to taste test the pork. I decided to create different recipes for different cuts and eventually, you will be able to see a selection of my way to cook Murray Valley Pork. To start the series, in this post today, I am just going to show a cheat recipe – a product that has already been prepared for you to cook in the oven. 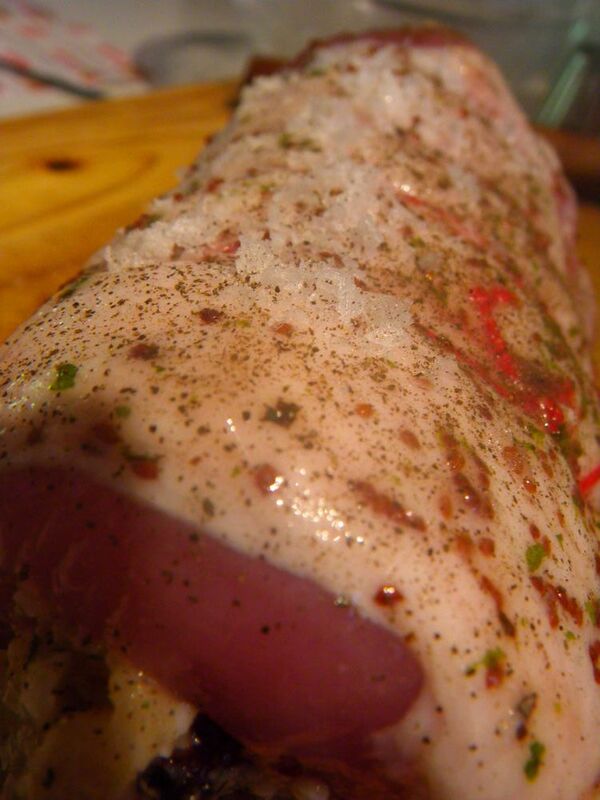 Hence, this post is mainly a post talking about some sensory aspects of the pork cut and in future posts, I will show some interesting way to cook pork, both Western and Eastern. Although Christmas and the New Year celebrations have passed for two months, more festivals and family events are coming along. The product, Pork Roast with Cranberry and Almond, is designed for the purpose of serving a family function. I liked this product because the stuffing has already been made and I don’t have to worry about making a recipe myself. I wouldn’t call this as a recipe of myself because the stuffing has been pre-made. I added my favourite sweet sour pepper to go with the pork roast. So first up, sea salt was added to the top of the pork onto the fat park. Although I am not seeking crackling of any skin, the added saltiness made the dish tasting so delicious. 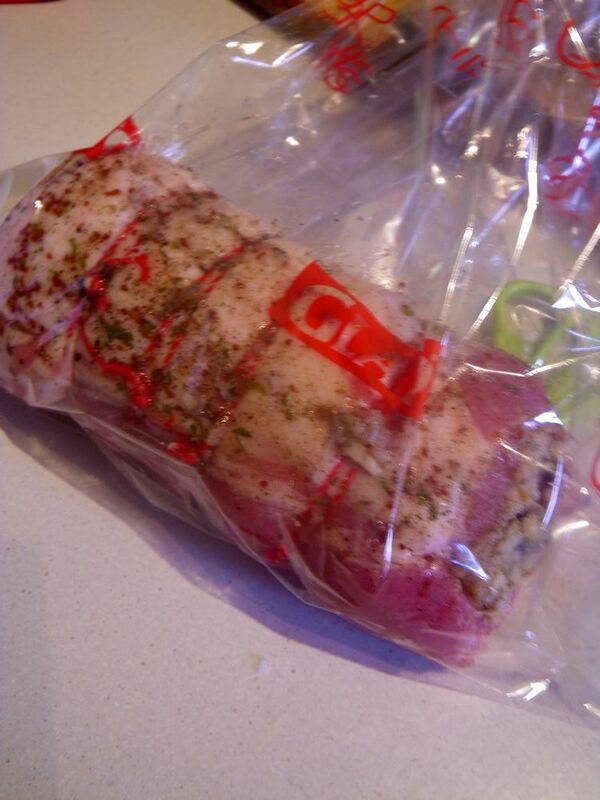 The pork roast was then placed in an oven bag and roasted at 150 oC preheated oven for 18 minutes. Resting time was 2 mins. The sweet and sour pepper recipe can be found in my other post here, except tarragon was added instead of spring onion to improve the spiciness of the dish. In terms of taste, oh man, it’s “simply delicious”! The pork was so tender and was full of juices. The fatty part of the roast actually got melt onto the meat and once I had the first bite, I could not stop eating these lovely pork roast. It was so sensational that two friends who visited us kept eating them without talking too much :D. The stuffing was very well made as the cranberry sweet and fruity hints complemented the pork flavour nicely while the nutty and creamy mouth-feel promoted the tasting experience of the pork. 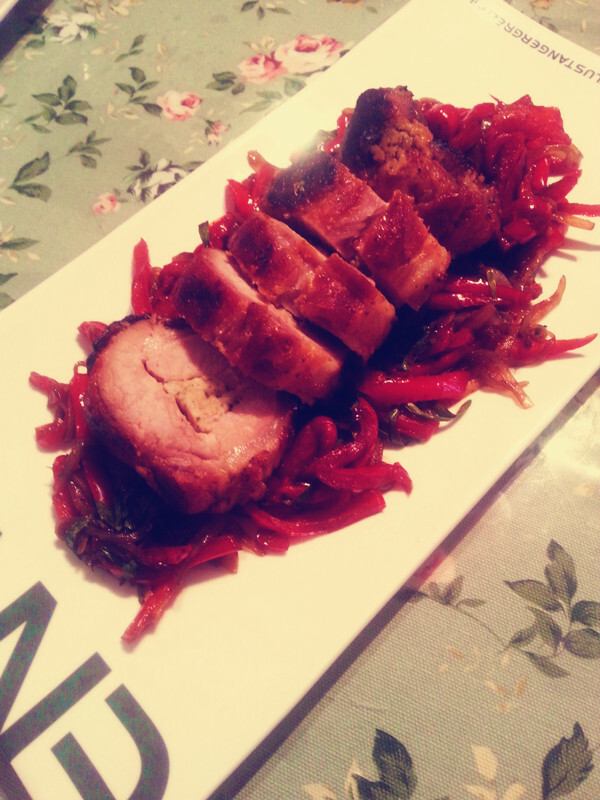 They sweet and sour pepper always goes well with pork and the new addition of tarragon has brought the pairing of the pepper with the pork to a completely new level and the fragrance of both dishes were long lasting. If you have not experienced Murray Valley Pork yourself, you can purchase them across the country. In South Australia, it’s available in a number of butcher, including Feast!Fine Foods in the Central Market. Our family has been a fan and loyal customer of Murray Valley Pork for a while and we always look forward to try new pork dishes. The pork roast sounds truly delish! Thanks for sharing. G’day! Your recipe sounds delicious Xin! Wish I could try some right not! I am not a big pork eater, but sounds delish! G’day. Simple and delicious for home cooks. Cheers! WONDERFUL post! 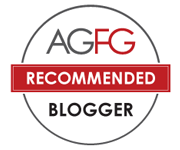 I nominated your blog for the 2014 SAVEUR BEST FOOD BLOG. Good luck! Really?! Thanks so much for your nomination Jess! That pork looks tender, juicy and delicious. My mouth is watering. I think I would have cleared everything on the plate! thanks for sharing!